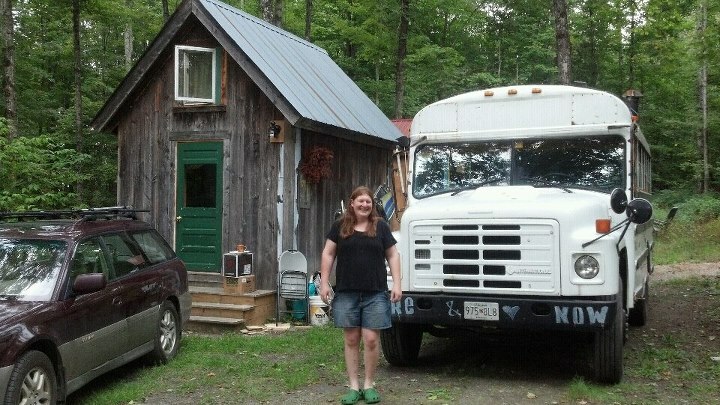 Join me on my adventures of tiny house living. From composting toilets to gravity fed sinks, creative solutions in storage to the benefits of purging, learn about the benefits of the tiny house lifestyle while laughing along with my exploits. Living tiny is all about living exactly how I want to. It enables me to close up shop at any time to go off and hike or bike with friends, or alone. It allows me to work less, doing work I love doing, and not worry about making mortgage payments or struggling to keep the oil tank full. It costs very little to live, and that allows me to live a lot! In the spring of 2010, I decided that six years of life in Washington DC was too long and that I was a country girl at heart. So I quit my job at a small food coop, packed up my 1995 Dodge Dakota pickup truck and a trailer (that I built up just for this move), and drove home. I spent the summer bicycling 4,500 miles from Virginia to Oregon, and then officially moved back in with my parents at the end of August. I took a job at the little corner store across from out house, a job which I kept until spring of 2013 when I left again for my next big bike trip! I quickly learned that while I love my parents dearly, I needed my own space. I’d burned out on paying rent in DC and needed a better, cheaper solution. At the time, my parents were building themselves a new home, a mile from the house I’d grown up in. In preparation to build their house they had moved a 10 foot by 12 foot tool shed up from my grandparents home, a tool shed which my stepfather had built 30 years earlier. By late fall the shell of their new house was up and they no longer needed the tool shed to store their tools… the wheels were spinning! I told them I wanted to convert their tool shed into a tiny house. They thought I was crazy but after hearing me out they gave me the go-ahead. I spent hours over the next weeks sitting on a five gallon joint compound bucket in the center of my soon to be home — imagining. I used chalk to draw out floor plans and did endless research on tiny houses online. I drew plan after plan, and finally came to one I liked – though it changed often throughout the building process. By mid-september I’d replaced the old fashioned shed windows and doors with higher quality, second hand windows from the local reused building supply stores in Burlington and Barre. I then drove to a warehouse in Brattleborro to get a truck and trailer load of second hand two inch foam board insulation, as well as a dozen sheets of 3/4 inch plywood, also used once. This was enough insulation for 4 inches of foam board floor and ceiling. Luckily the cabin is up on 2 cinder blocks so their was enough of a crawl space to insulate the floor from underneath. Unfortunately I’ve found the air space underneath also makes the floor cold all winter, so I’m working on fixing that! The walls got wired, insulated with blown in cellulose and covered with free 1×8 ship-lap pine I got as scraps from a house my stepfather (a carpenter) was building. Score for me! I raised the shed roof off the back and added a small camper style “bump-out” so I’d have a downstairs twin bed for sleepover parties! It didn’t take long for it to start looking like a house. One of the reasons tiny house living works so well for me is that, frankly, I’m not home that much! While it’s a fully functional year-round dwelling, and I’m sure I could happily live in it as such, my lifestyle is such that I’m in and out a lot. One of my income strategies is house sitting, which I’m typically doing for between half and 2/3rds of the nights of any given month. Additionally I go camping A LOT, spend time visiting friends, and tend to go on long vacations such as last summers two month bike trip. As such, my house is a place to come home to and to store my meager possessions, but doesn’t need to have things like flush toilets, showers or laundry because I’m living places with those things plenty often to go without them when I’m at home! In addition to being a tiny house enthusiast and outdoor adventure lover I’m a home-care provider by day and a star gazer by night. I’m a ski bum and just formed the blog, SkiTheDeals.com, which is a great place to find all the best discount ski tickets you want! I’m also a queer trans-woman with a colorful history! To learn more about this aspect of my life, as well as the related work I do, visit my other website, www.transitiondoula.net. Thanks! If you want to be in touch, find me on Facebook or shoot me an email: tinyhouseadventures (at) gmail (dot) com.